Materials from the meetings (minutes, agendas and community notices) are available below. A list-serve will be provided to facilitate communications regarding future meetings and all relevant materials (including minutes of previous meetings) will be posted on this website. 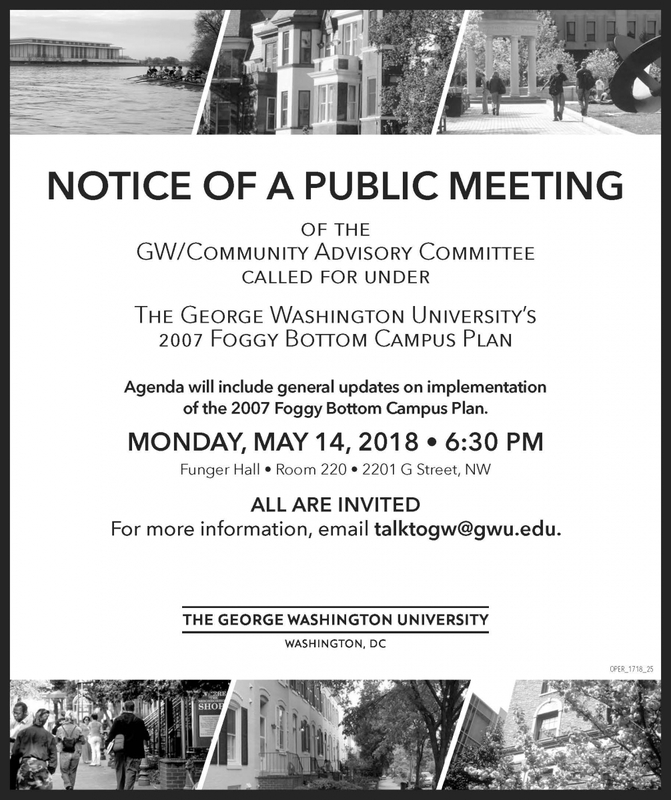 Additionally, notices required under the 2007 Foggy Bottom Campus Plan will be sent by letter to the Chair of the Foggy Bottom/West End Advisory Neighborhood Commission (ANC 2A) and additional written notice will be sent to representatives of the Foggy Bottom Association (FBA) and West End Citizens Association (WECA). Also, an advertisement will be placed in the Foggy Bottom Current newspaper.